We will register you for My Endesa if you aren’t already registered. The bill will be sent to you via email as soon as it is issued. Don’t wait for your bank to send it to you. You have all the details on the amount you pay and on your hourly consumption. You contribute to preserving the environment. You can go back to your paper bill whenever you want. You will receive all the information long before your bank charges you. As soon as the bill comes off the press we will notify you via email, breaking down how you have consumed your electricity over the past month and how much it will cost you. Waiting for a month or two to find out your daily and hourly consumption is a thing of the past. You will get all the details whenever you want. All fluctuations, all graphs, every hour of every day. You can configure the alerts you want, setting consumption limits and receiving the alert via email or on your mobile when you are going over the limit. You can finally discover the culprit behind those spikes on your bill. Could it be the washing machine? Could it be the heating? Could it be an appliance that nobody suspects? We will tell you if you are an efficient or wasteful consumer (and what to do to improve it). You can activate different saving levers... A personalised directory of advice applications that never stops growing. Forget paper, you will get your digital bill wherever you want. 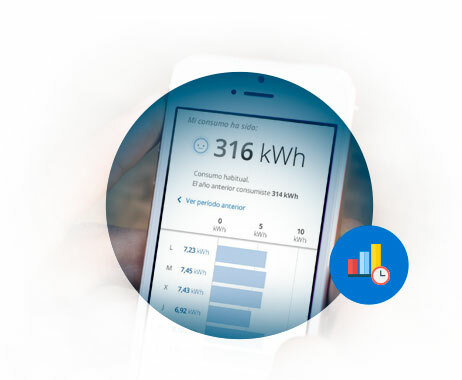 Smart energy has reached your Smartphone, from it you can check all of your data and manage it. What does signing up for the electronic billing service mean? When signing up for the electronic billing service you must register on the endesaclientes.com website (if you haven’t already) and activate your digital bill. This will allow you to understand in detail where you are spending your money. You will understand your electricity consumption like never before and you will be able to save money effortlessly. What are the 5 main advantages of signing up for the electronic billing service? You will know more about your bill and you will know sooner: you will receive all the information long before your bank charges you. As soon as the bill comes off the press we will notify you with an email that breaks down how you have consumed your electricity over the past month and how much it will cost you. Your electricity consumption instantly: waiting for a month or two to find out your daily and hourly consumption is over. You will get all the details whenever you want. All fluctuations, all graphs, every hour of every day. Alerts in case you go over your spending limit: you can configure the alerts you want, setting consumption limits and receiving the alert via email or on your mobile when you are going over the limit. A wide range of saving and efficiency tools: you will know which home appliances are inflating your bill, we will tell you if you are an efficient or wasteful consumer (and what to do to improve it). You can activate different saving levers... A personalised directory of advice applications that never stops growing. And it is all available on your mobile: smart energy has reached your Smartphone, from it you can check all of your data and manage it. If I activate it and I change my mind, can I deactivate it and go back to paper? Do I have to pay for the digital bill? No, it is free. Enjoying all the advantages of digitalisation will not cost you anything. Does this click stop them from cutting down trees? Absolutely. You can start to work it out: if one tree makes 8,000 sheets, what can we achieve if millions of people stop receiving paper bills every month? What requirements do I have to fulfil to become digitalised? I like the idea of becoming digitalised... but I still want to receive the traditional bill. No problem. When becoming digitalised you access a whole new universe of advantages, but you keep your traditional bill in PDF format, which is available instantly, without having to wait for the postman to deliver it. How can you have all the data on my consumption, every hour and every day? It is possible thanks to newSmart meters.They monitor your consumption and send your data remotely, without an engineer having to visit your home. This allows your tariff to be always based on your real consumption. If you already have a Smart meter, you can enjoy all the advantages of being a digital customer. If you do not yet have a Smart meter, it is just a matter of time before your distributor installs one (this will be before 2019). Until then, you can still enjoy many of the advantages of digitalisation. Does a digital bill have the same legal standing as a paper bill? Yes. In the event of an incident or should you wish to make a claim, the digital bill is equally or even more valid (as it holds more information) than the paper bill. Is the electronic billing service safe? Completely safe. It includes a digital signature that guarantees the authenticity of the issuer and the integrity of its content. 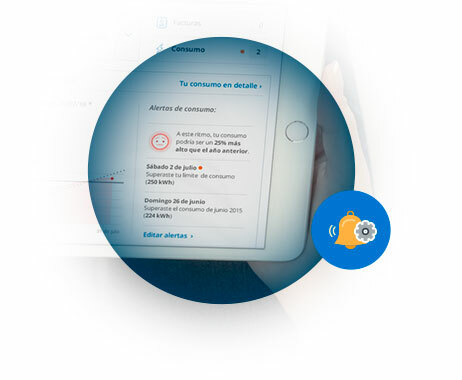 Endesa has an electronic certificate from the Spanish Notarised Certification Agency that allows us to incorporate an advanced electronic signature on all of our bills. These General Terms and Conditions shall govern the contractual relationship between ENDESA, with registered address in Madrid, Calle Ribera del Loira 60 and My Endesa customers that register with the Electronic Billing service. The fulfilment by users of each step of the electronic billing registration process entails their express, full and unreserved adherence to all these General Terms and Conditions for registration with the Electronic Billing service. The purpose of these General Terms and Conditions is to enable My Endesa customers to use the ENDESACLIENTES Electronic Billing Service. Registration with this service means that once the registration enters into force, the customer will no longer receive his/her bill in printed format by regular mail, as established in the following clauses. 2.1.Registration with the ENDESACLIENTES Electronic Billing service shall be voluntary and free of charge for the customer. The customer may withdraw from their request at any point and return to the normal printed billing format, by informing ENDESA via My Endesa. 2.2. Bills issued by ENDESA for the different services provided shall be uploaded to the ENDESACLIENTES website in XML and PDF format. Customers will be able to view the bills online and these will appear in exactly the same format as the printed bills sent to their address (PDF format). 2.3. When customers register with this service, they will no longer receive printed bills sent by regular post to their address. 2.4. This service not only enables the itemised bill to be viewed on the screen, customers can also download the bill to their computers. An electronic bill obtained in this manner is based on the use of a digital signature system that enables the authenticity of its origin and the integrity of the content to be guaranteed, pursuant to the terms set forth in ORDER EHA/962/2007 (Official State Gazette of 14 April 2007). ENDESA has obtained a recognised electronic certificate issued by the ANCERT, which authorises the incorporation of advanced electronic signatures on its bills. 2.5. The ENDESACLIENTES Electronic Billing Service shall be implemented via an email sent to registered customers informing them that their bills for the different services they have contracted are available and can be viewed at ENDESACLIENTES via My Endesa. 2.6. In any event, the service user shall be responsible for informing ENDESA of any changes to the email address via which they would like to receive notifications. If users do not receive the notification as a result of an invalid email address given to ENDESA or for any other reason, this shall not mean they can no longer benefit from the Electronic Billing service once they have registered with the service and not cancelled their request at any later date. 3.1. Registration with this service shall be via My Endesa (www.endesaclientes.com), where, once users have authenticated themselves with their username and personal and secret password, this Electronic Billing service may be contracted pursuant to these General Terms and Conditions. 3.2. 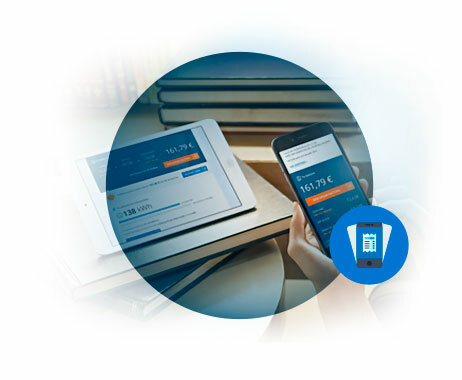 If users have various contracts or they have contracted a number of services provided by ENDESA that generate different bills, this registration with the Electronic Billing service shall be applied to all the contracts selected by the customer and which use the same Tax Identification details. This registration shall only affect the part of the bill that was issued and sent to the customer in printed format. 4.1. It shall be understood that the user agrees to the registration of the ENDESACLIENTES Electronic Billing service from the moment the user successfully completes and sends their acceptance with the form on this website. Henceforth, the user accepts and fully adheres to all the General Terms and Conditions outlined in this text. 5.1.a). 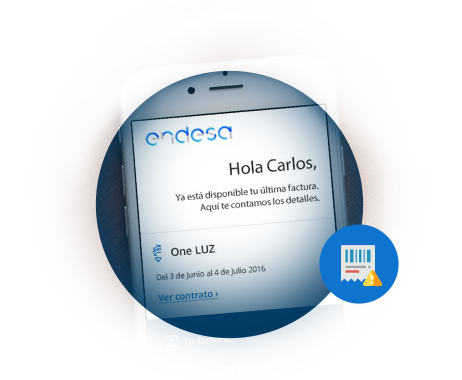 ENDESA shall implement a service via ENDESACLIENTES for sending emails to the email addresses provided by users that are registered with the service. 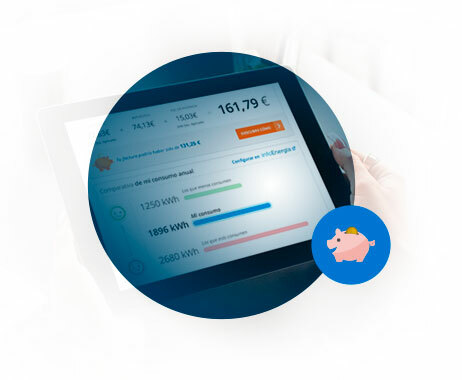 Users of this service will receive a message in their inbox informing them that their itemised bills are now available at My Endesa "www.endesaclientes.com" and, if applicable, can now be printed at home. 5.1.b). If the computer system detects that a sent email has not been received correctly, this email will be resent. In any event, the possibility of viewing Electronic Bills at My Endesa via the "www.endesaclientes.com" website is not dependent upon the notification message being sent and received, as this is purely for informational purposes, and customers are responsible for duly updating their email address. 5.2.a). The notification sent via email will not include any information concerning your bill, except the date of issue and the reference number for your contract and the amount. 5.2.b). When customers access My Endesa at www.endesaclientes.com to view their bills, they will only be asked to authenticate themselves via the validation of their username and password, which shall be unique for each customer and given to users in a confidential manner. 5.2.c). Furthermore, customers may, at any given time, change their access password via the change password feature offered by My Endesa. 6.1.a). To correctly, honestly and accurately complete all the fields in the application forms pursuant to the instructions provided in this regard by My Endesa at www.endesaclientes.com. 6.1.b). To promptly communicate any changes to the email address or addresses provided for notifications via the procedures established by My Endesa at www.endesaclientes.com. 6.1.c). To complete all the fields on the form unless stated otherwise. Failure to do this shall mean that ENDESA shall not guarantee the provision of all the services offered via My Endesa, in particular the commitment to send the notification to the email address if this address is not provided correctly. 7.1. The customer guarantees and shall be responsible, in any event, for the veracity, accuracy, validity and authenticity of the Personal Data provided via the ENDESACLIENTES application forms. 8.1. Pursuant to the provisions set forth in the Organic Law on the Protection of Personal Data (LO15/1999), the customer is hereby informed and gives consent for his/her personal data to be processed as a result of contracting this service, in accordance with the terms and conditions established in the Legal Notice section. 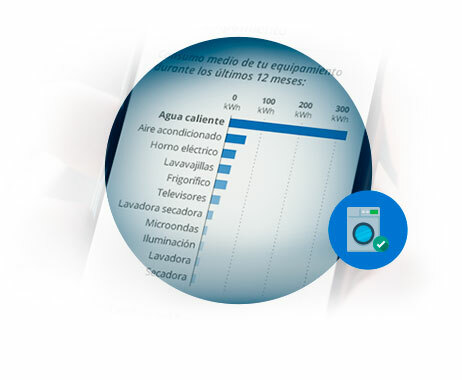 Now in Mi Endesa you can know every day and hour the data of your consumption, without waiting for the bill. This information is necessary to be able to process your discharge and we will provide it for your convenience. If you want you can confirm this in your bills Endesa in the section “Data of the contract” under the name, Reference of the contract. If you have any question about your contract you can call us at 800 760 206 and a manager will help you. Our hours of operation are from M – F from 9:00 am to 09:00 pm.